Dobrić is one of the narrow stepped streets that zig-zags its way down from the Kalelarga towards the Riva, passing a small piazza about half-way down. 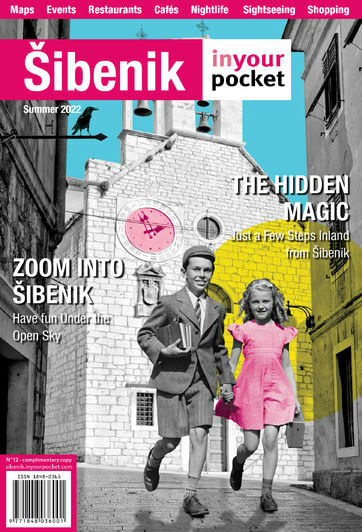 High up on the façade of one of the piazza’s houses is Šibenik’s most enigmatic sight, the Rebus or riddle. It basically consists of an oblong stone relief bearing five symbols – bird’s wings, crossed scythes, two wine flagons, a trio of gaming dice, and a human skull. The artisan who carved the Rebus was obviously delivering a mischievously morbid message, although opinion differs as to precisely what this is: a cautionary tale about the dangers of drinking and gaming seems to be part of the explanation. Whatever the Rebus is warning you about, it seems certain that you will be quite dead at the end of it.